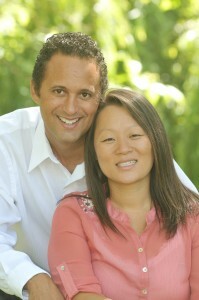 Eric and Mimi met in Los Angeles, CA in the summer of 1999. Eric was asked to speak at a Korean Youth Group and Mimi was his hostess for the day. They were as different as different could be. Eric is an only child. Mimi is number seven of eight. Eric is Native American. Mimi is Korean. But as they talked, they found they had one thing in common. A love for missions! Mimi had just returned from the Ukraine working in an orphanage and was preparing to go to Korea. Eric had been to Italy and Costa Rica and was in graduate school training to be a campus missionary. Little did they know that God had taken them around the world with a plan to cross cultures in a unique way! In 2001 Eric and Mimi were married and they have been on a mission to honor God with their lives ever since.